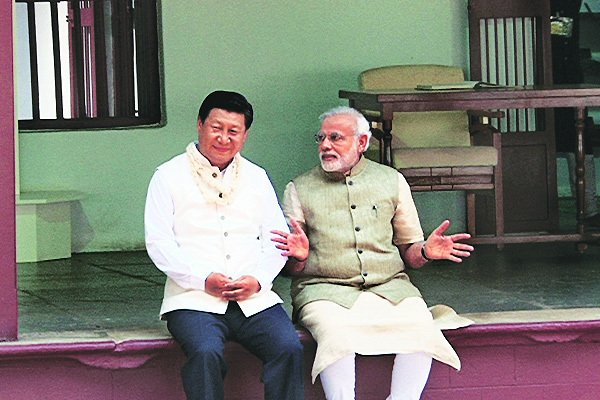 Political and economic compulsions appear to be taking India’s Prime Minister Narendra Modi and China’s President Xi Jinping towards a Sino-Indian détente, Top diplomats of the two countries are clearing the path for an understanding which may hold at least for a while, though many basic issues are likely to remain unsolved, writes P.K.Balachandran in South Asian Monitor. Modi needs a breather to set his economic house in order to be able to face a tough parliamentary election in May 2019. He knows that he can get the breather only if relations with China are put on an even keel after the severe jolt they suffered as a result of the 72-day standoff over Doklam on the Sino-Indian border in the second half of 2017. On his part, Xi needs India’s cooperation to make his ambitious One Belt One Road (OBOR) Initiative a success. If Deng Xiaoping made China an economic power house, Xi wants to make China a decisive force in global politics and economics through the multi-trillion dollar OBOR initiative.Having got the right to contest for the Presidency any number of times, Xi has acquired a long term interest in the OBOR. And if Xi is to succeed, he has to enter the Indian market, South Asia’s biggest, for trade and investment. He has to have India on board the OBOR in one way or the other. If the current slowing of China’s economic growth is to be ended, it has to enter the Indian market both for investment and trade. China has been trying to cajole India to let Chinese companies invest in India and enter the Indian market in a bigger way but Indian security agencies have stonewalled Beijing’s moves much to the latter’s chagrin.China is therefore keen to see ice with India broken. Three years down his tenure as Prime Minister and a little over a year to go for the next parliamentary elections, Modi is saddled with a sluggish economy with high unemployment. This has been affecting his Bharatiya Janata Party’s electoral performance in State Assembly elections though he has managed to score victories by using divisive social issues, anti-incumbent feelings in States long ruled by other parties, and Machiavellian post-election moves. The performance of the Indian economy has been none too good under Modi’s watch despite all the hype over his “Make in India” initiative. Industrial and agricultural production has been falling, and job generation abysmally low. Economic distress is evident in the recent massive march of farmers to Mumbai following 2500 farmer suicides triggered by the burden of debt cast on them by the BJP-led governments’ policies in the Center and the States. Modihas been unable to meet the single biggest promise he had made in his election speeches in 2014 – to provide10 million jobs per year, with some reports put the pledge at 20 million. According to the Indian Labor Ministry, between 2009 and 2011 (when the Congress was in power) the organized industrial sector was producing on average, 950,000 new jobs every year. But after Modi took over, in 2015 and 2016, the average employment generation had plummeted to less than 200,000 jobs a year, less than 25% of the annual employment generated before 2011. There has been a precipitous fall in employment growth in textiles, metals, leather, gems and jewelry, IT and BPO, transport, automobiles and handlooms, sectors in which India has a place in the global marketplace, reports say. This is majorly because the manufacturing sector has been growing at the snail’s pace of 1.5% annually. Due to demonetization in late 2016, the unorganized small manufacturers suffered a huge dent in both output and employment. In the small and medium industries sector, which accounts for 85% of the Indian labor force, at least 250,000 units had shut down. The topbrass in the IT and BPO sectors warn of a massive skill shortage.IT and BPO sectors, which employ four million people, 60% of the workforce will not be of any use given their present skills. Agriculture growth has dropped from 3.5% to 1.7% under Modi. To compensate for lack of production, government has been importing wheat and pulses instead of helping local farmers to grow more and get better prices.“This is Make in India in agriculture,” taunted Congress leader and Upper House member Jairam Ramesh. According to Ramesh, under the Modi government’s crop insurance scheme, insurance firms collected INR 160,000 million from farmers as premium in two years, but farmers got only Rs 70,000million. Farmers in several parts of India including Maharashtra and Telengana are under severe debt. Debt had driven more than 2500 of them to suicide. The recent massive march of farmers to Mumbai on the debt issue is an acute embarrassment to the BJP-led government in Maharashtra. The Indian Army chief, Gen. Bipin Rawat, boasted that India can fight a “two-front war”, one against China and the other against Pakistan, but the boast only invited ridicule from the knowledgeable. Thearmy is both ill-equipped and short of manpower especially at the officer level. The army itself has complained that the allocation of INR 210,000 million in the budget is woefully inadequate to meet the twin challenge from China and Pakistan. Modi is expected to keep up tension with Pakistan because this will yield electoral dividends at least in anti-Muslim North and Western India. But he is keen on lessening it vis-à-vis China as increasing tension will not yield any electoral gains. Issues with China have little or no traction with the Indian electorate. They only bother the media and the diplomatic and security Establishments. Pakistani artistes and sportsmen continue to be banned and their diplomats are harassed in response to similar harassments across the border. The Line of Control in Kashmir is still the scene of frequent cross border firing and casualties. But diplomatic engagement between India and China got back on track after the Doklam standoff with the visit of Chinese Foreign Minister Wang Yi to India to attend the Russia India China Foreign Ministers meeting in December 2017. Next month, Indian Foreign Minister Sushma Swarajwill travel to China in April to participate in the Foreign Ministers meeting ahead of the Shanghai Cooperation Organization (SCO) summit in the Chinese city of Qingdao in June which will be attended by Modi. Wang and Chinese State Councilor (National Security Adviser) Yang Jiechi had visited India in December last. Modi and Xi had briefly met on the sidelines of the September 2017 summit of the BRICS countries in the Chinese coastal city of Xiamen. The new Indian Foreign Secretary Vijay Gokhale had visited China on February 23. A string of track-1 meetings are now in the offing, including the China-India strategic economic dialogue, which is likely to be preceded by visits to India of Chinese Commerce Minister Zhong Shan and of Guo Yezhou, Vice Minister in the International Department of the Communist Party of China. Indian Army Chief Bipin Rawat has said that India-China joint military exercises, suspended after the standoff in Doklam, will be resumed soon because relations are back on track. As part of the diplomatic deck clearing, the Indian government has asked Indian officials and political leaders not to attend functions organized to mark the 60thAnniversary of Tibetan leader Dalai Lama’s flight to India. Beijing considers the Tibetan spiritual leader as a separatist. The venue of the “Thank You India” functions have been shifted from New Delhi to Dalai Lama’s camp in Dharamsala in Uttar Pradesh. An invitation to him to attend the Indian Science Congress in Manipur has also been withdrawn.